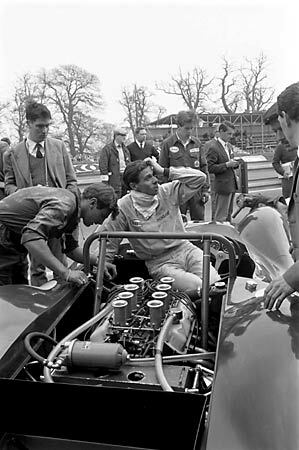 Even Jimmy Clark had his days in the Lotus 30. Photo Courtesy of Ford Motor Company. Jim Clark was a natural when it came to motor racing – his skill was simply beyond compare. His ability to adapt his technique to any car was unsurpassed, as the time he was racing a Lotus 33 Formula 1 car when the rear anti-sway bar came loose demonstrates. Not only was Clark able to keep the car under control as the car’s handling was drastically changing, but he also was able to maintain his lead in the race without the bar! The Lotus 30 and 40 have been said to be the only cars that ever taxed Jimmy’s skills. Despite racing them in numerous races from 1964-65 and even finishing first in several of them, he never seemed to have good luck while racing one. Jim was killed at Hockenheim, Germany, April 1968 in a Formula 2 Lotus. See a Competition Listing of all of the races in which Jim Clark completed in during his life. Graham Gauld, personal e-mail, Apr. 9, 2002.